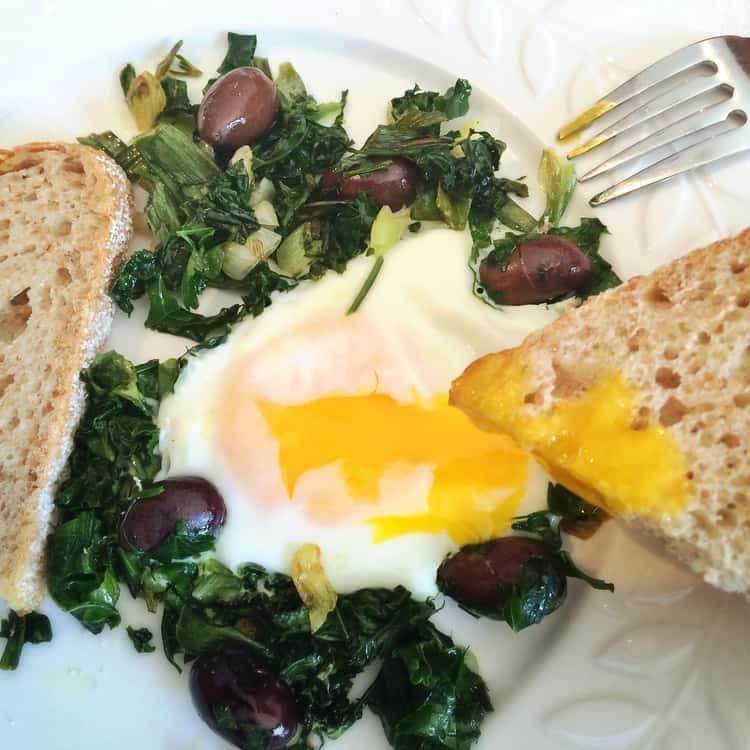 Eggs are my go-to for lunch. 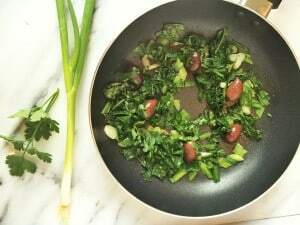 This is a favorite lunch dish using whichever greens you have on hand. Do any of you recall the “Peanuts” series of books entitled “Happiness is…”? For some reason that’s the first thing that came to mind today as I enjoyed my lunch. 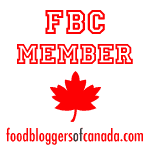 I decided right there and then I had to share this simply amazing dish with you! 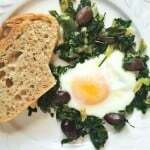 I had forgotten all about this simple Fried Egg with Greens that my mother used to make, usually for lunch. It consisted of fresh greens from the garden that might include any combination of the following: green onions, garlic scapes, young broccolini, parsley and olives (not from the garden of course!). The idea had come from my maternal grandmother who suggested that my mother fry up the overabundance of parsley from the garden with eggs. Such a simple dish that only takes five minutes to make but, oh the flavors! The sweetness of the fried green onions and the sharp, briny flavor of the olives are a match made in heaven. Served with fresh bread, you have the perfect meal any time of day. 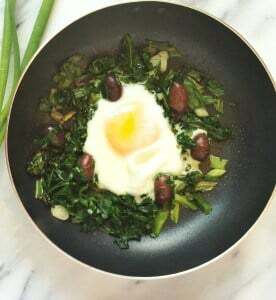 Today I used green onions, parsley from the garden, olives and since I don’t have any broccolini I used a kale leaf. I made a single portion and didn’t really measure any ingredients. Here I stuck to my mother’s method, meaning a handful of this and that. You just have to try this recipe and let me know if it has the same effect on you! If you do make it, don’t forget to photograph it and tag me with #mangiabedda or@mangiabedda on Instagram or Facebook. Enjoy! 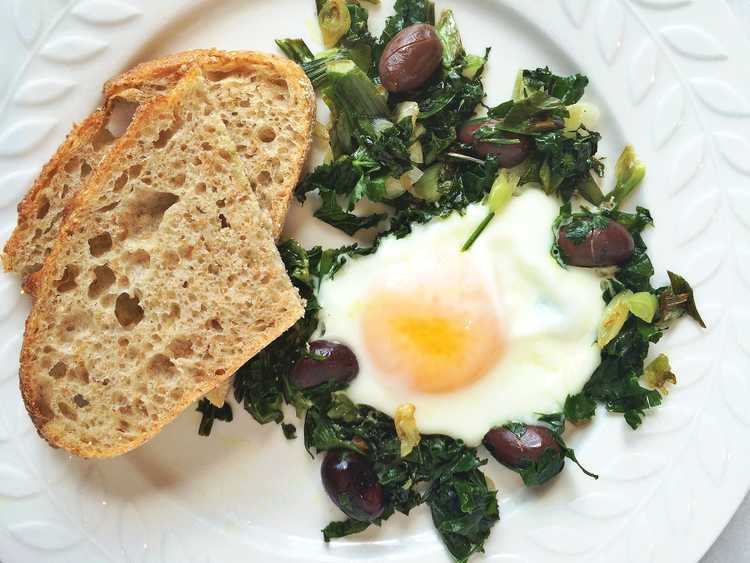 A fried sunny side up egg with fresh greens is the ideal, satisfying breakfast or lunch! Heat about 1 tablespoon of olive oil in a small non stick pan. Add green onions, kale, and parsley and cook with the lid on for about 3 minutes. Remove lid, add salt and pepper and olives. Make a well in the center of the pan and add the egg. Continue cooking with the lid on until the egg is cooked but the yolk is still runny, 2-3 minutes. Serve hot with fresh bread. Thanks Loreto! My mother taught me this recipe. You can toss in whichever greens you have on hand. I've also added mushrooms. It's an easy and quick lunch and my family enjoys it.